We can honestly say we had the most amazing wedding day at Sopley Mill ..."
We had the most perfect day at Sopley Mill, everything was seamless an ..."
To the wonderful team at Sopley Mill, We just wanted to say a big than ..."
…a brilliant story, beautiful venue and a fantastic day." The perfect backdrop for a perfect day." Christmas is a very special time of the year. It’s a time to spend with loved ones, family, friends and even work colleagues at the annual work Christmas party. It’s a time to let your hair down and pick up a glass or two of your favourite tipple, it’s the time to tuck into mince pies and mulled wine, roast dinners (or lunches), to wear silly Christmas hats and pull Christmas crackers – it’s a festive and fun time! 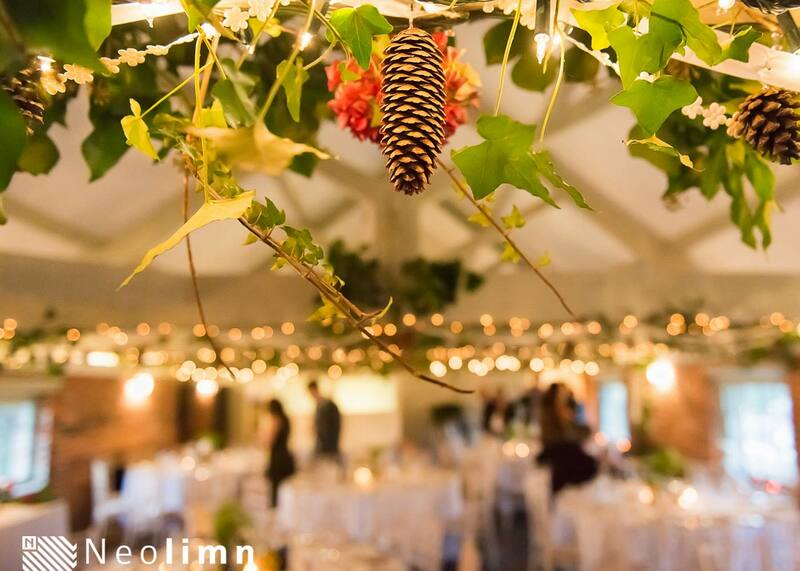 Whether you are lucky enough to have a birthday close to Christmas and hopefully get double the number of presents, or whether it is celebrating a special wedding anniversary or even if it is the work Christmas party, Sopley Mill provides a romantic, festive and stunningly beautiful venue in which to celebrate. Roaring fireplaces, cosy couches and twinkly fairy lights all add to the ambience and nostalgic feel of the Mill. You can decorate the Mill how you would like – and we think the more decorations, the merrier. Forests of christmas trees adorned with lights and decorations around the gardens, twinkly lights off every beam, candles and lanterns, mugs of mulled wine and gingerbread men on hand to take the chill out of the air. You might even get away with a elf or two! Want to take a look around? Call us on +44 (0)1425 672586 to arrange a viewing or contact us via weddings@sopleymill.co.uk for more information. Sign up here to receive all the latest news, updates and offers. latest news, updates and offers.